PCU recently had the opportunity to test out Movie Buff, a card game from relative newcomer Golden Bell Studios. The great thing about this game, is that it is most definitely not a Trivial Pursuit type of game which requires knowledge limited to the four corners of the box. Rather, the players themselves use their existing knowledge to determine just how complex the game will get, and indeed, one player’s movie knowlege might be the downfall of another’s. 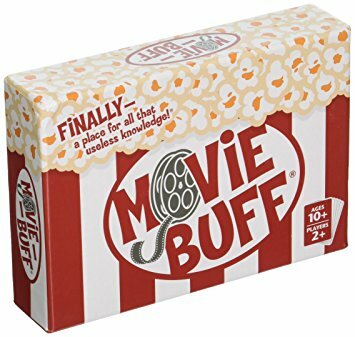 Movie Buff is an Uno style game for at least two players (no limit is given–we easily played with six) are attempting to discard all their cards. The main cards you can end up with are “Movie,” “Actor,” “Role,” and “Quote.” The goal is to take turns discarding your cards and create a complete “Scene” and move on to a new set. For example, a player might discard a “Movie” card and declare The Empire Strikes Back. The next player might put down an “Actor” and say “Mark Hammil.” Players can keep playing similar types of cards within the same movie until the entire scene is complete–unless they can’t think of anything, or have no playable cards, and then have to pick up a new one. The PCU team had a lot of fun playing this, and there’s opportunities to pit one player’s knowledge against the other’s. At one point, a player called out Dirty Dancing 2: Havana Nights, a film most of the others hadn’t seen, which definitely impacted the majority of players’ ability to proceed. Fortunately, there’s a number of “saving” cards which can protect a player with limited knowledge, such as “Take 5” (skips your turn), “Reverse Angle” (sends play back in the other direction), or “Cut” (ends the scene and starts a new round). Like I said, Movie Buff only requires the knowledge the players bring to the table, and you can play it whether your expertise is in sci-fi, rom-coms, or old silent films. Play wasn’t terribly difficult once we figured out the rules, and it’s the kind of game that would lend itself to multiple replays (and a few rounds of alcohol would have made it even more fun). It also comes in a very durable and attractive box with magnetic seals for easy access. The only improvement this game could have is the inclusion of a time rule or an hourglass, as players could definitely stall if there isn’t a motivation to answer quickly. At $24.95, it is a little pricey, but definitely worth the fun. Thanks to Golden Bell Entertainment for the sample copy.